For something a bit different this Christmas, why not make your own wreath decorations. They’re amazingly quick to make and will be an attractive feature in your home. 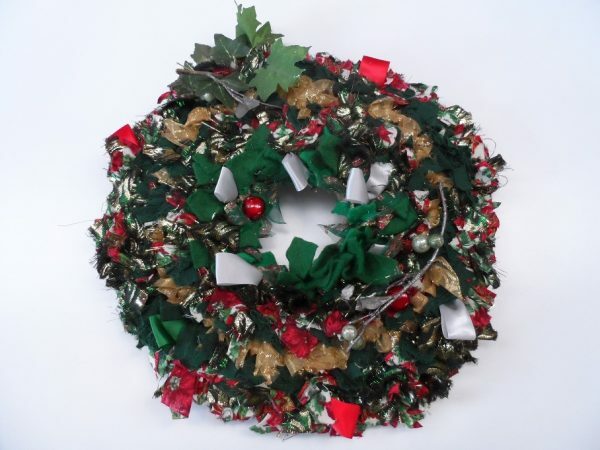 To make your wreath, first cut out a large circle of hessian (pre-made templates are available from our online shop). Then draw two circles, one larger than the other, being careful to leave bare hessian around the outer edge and the middle. Using the rag rugger, fill in between the two circles. You can either use short pieces for a shaggy effect or long pieces for a flatter, tidier effect. Both methods are very effective but the shaggy effect will look more like the traditional style wreaths. If you splash out on some festive material or ribbon then your wreath will really sparkle! Green and red netting material also looks attractive and is very easy to work with. It also feels surprisingly soft when it’s in place. When your wreath is looking suitably festive, you need to create flaps around the outside and inside of it using that bare hessian. Using a nice sharp pair of scissors, cut through the inner circle to create four triangular flaps and then through the outer circle to create eight trapezoidal flaps. Now you need to mount your wreath onto a back piece. The cheapest and easiest material to use for this is cardboard. Simply cut a ring of cardboard to the same size as the filled-in section of your wreath. Turn the wreath over so that the back is showing and put the cardboard on top. Cover the top of the cardboard with a thick layer of PVA glue then pull the flaps of hessian tightly around the cardboard and pat down so that the glue sinks into the hessian. You may wish to add more glue at this stage to ensure that it is really secure. Leave at least 24 hours for the glue to dry and you will then have a rigid wreath ready for hanging. The back of it will look rather untidy but once it’s on the wall only you will know. As an optional extra you may now wish to add fir cones, berries and greenery. For a hanging rather than a wall mounted wreath, make two and then glue them back-to-back.